Paperclippings Blog: Discovery rises to the occasion! Paperclippings Blog: Discovery rises to the occasion! In 1995 the space shuttle Discovery made a visit to Salt Lake City, Utah. I took my youngsters to this once in a life time event. So, when I learned that it was this very space shuttle that took our great country back into space for the first time since the Columbia disaster I cheered. 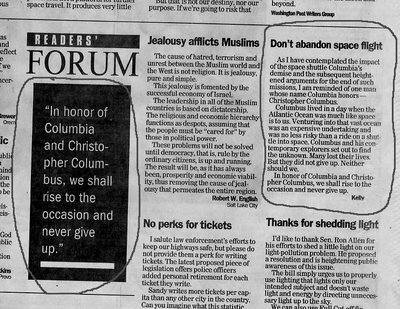 But then I thought more about how apropo the name Discovery is in the context of a letter I wrote to the editor shortly after the demise of Columbia. As I have contemplated the impact of the space shuttle Columbia's demise and the subsequent heightened arguments for the end of such missions I am reminded of one man whose name Columbia honors--Christopher Columbus. Columbus lived in a day when the Atlantic Ocean was much like space is to us. Venturing into that vast ocean was an expensive undertaking and was no less risky than a ride on a shuttle into space. Columbus and his contemporary explorers set out to find the unknown. Many lost their lives. But they did not give up. Neither should we. In honor of Columbia and Christopher Columbus, we shall rise to the occasion and never give up. I add to those words I penned at that time..."and just as Christopher Columbus and his contemporaries did we will set sail on a voyage of discovery on the space shuttle Discovery. "They don't get much better than this."